A saxophone and atmospheric lighting greeted the guests as they arrived at Porvoo Refinery's 50th anniversary this September. Porvoo Art Factory housed the festivities arranged for over 100 stakeholders, among others, representatives of the government and the city of Porvoo, clients and former employees. Neste has gloriously transformed through the years from a traditional oil refining company into an innovating enterprise. 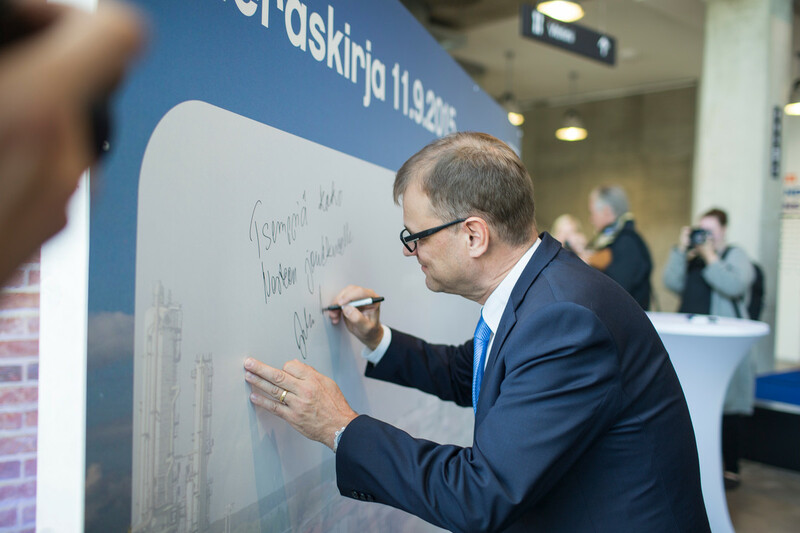 In his speech, Neste CEO Matti Lievonen enhanced the resolute Neste attitude that has helped the company to succeed. Neste now develops high-class fossil and renewable fuels that are among the very best in the world. The company continuously explores the possibilities to use waste and residue to make renewable products. Jukka-Pekka Ujula, Mayor of the City of Porvoo, reminded the guests of the significance of Neste as a corporate citizen in Porvoo. Among the guests there also were former directors of the Porvoo Refinery. They have created a solid ground for contemporary success. Former directors Matti Niemi, Erkki Liimatainen and Jouko Huumonen enhanced the significance of the skills and commitment of Neste personnel in creating the future.